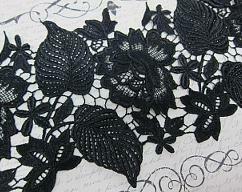 You are purchasing 1 yd of beautiful Venice lace. Size of lace is 2 inch (5.08 cm). Material 100% polyester. Perfect embellishment for any craft project. Enjoy it! 1yd Elegant Shabby Chic Cotton Embroidered Roses & Diamonds Lace - 3 "